Pieter Malan is one of three brothers who own and run Simonsig winery and vineyards in Stellenbosch. Pieter's task is marketing and he constantly travels the world, having just returned from China where they wanted to buy his entire Pinotage production. I caught him resting his feet at the rear of the stand after another busy day at the London International Wine Fair. An accident on his motor bike as he was about to depart for London had left Pieter in discomfort with a swollen lacerated leg on which he needed to stand for three long days to pour and talk about his wines. Pieter gamely agreed to tell us about Kaapse Vonkel Brut Rose, Simonsig's very succesful pink Cap Classique (= methode champenoise) made from 90% Pinotage and 10% Pinot Noir. Mark Lindhorst slaved as an accountant until he had enough to buy a farm in Paarl where he re-planted vineyards and added .6ha of Pinotage from which is made around 4,000 bottles "with love and devotion because we are Proudly South African." Mark was in London for the annual wine trade fair where I asked him to tell us about his silver medal winning 2006 Pinotage. If you make Pinotage then enter now for the 2010 Top 10 Competition sponsored bt ABSA and organised by the Pinotage Association. Deadline for entries is 15 July 2010 and winners will be announced on 9 September 2010. 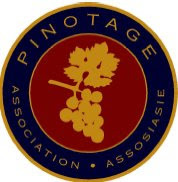 While Pinotage is made in many styles this competition is restricted to dry red Pinotages and international entries are welcome. 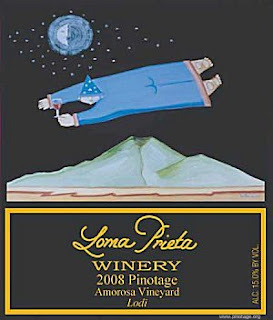 In previous years wineries in California and New Zealand have participated. The competition is unusual in that there are 10 equal winners in order to be able to reflect the many different interpretations of this intriguing variety. The Daily Telegraph / English cricket team third wine tasting was was hosted by Johann Rupert at his L'Ormarins Estate in Franschhoek. Johann Rupert pulled out two very old wines – a 1982 Rustenberg cabernet sauvignon and a 1974 Meerendal pinotage – which we drank after the formal tasting. Both were lovely, complex aged wines but it was the Pinotage that provided the big surprise. Pinotage is South Africa's one indigenous grape varietal, a cross between cinsault and pinot noir, and has been described by critics as having no redeeming features. Yet here was an aged Pinotage that was balanced, luscious and with none of the bitter aftertaste that characterises so many younger pinotages. The lesson: even a capricious style flourishes under the African sun if nature and nurture are applied in the correct balance. Some interesting comments about Pinotage from the judges of this years Old Mutual Trophy Wine Show. "'I've no bloody idea' and I still don't. I do know one thing and that is that Pinotage is capable of producing in many different personalities some really sublime wines and those are some delicious memories I will take away with me." "There was one which was my wine of the whole tasting, which I hope comes from a cooler area. It was much more Pinot like, tighter, had a nice sort of fynbos quality to it; something really individual which you felt came from where it was grown. The other ones which are fuller, richer wines also lovely characters, miles away from that old acetone, rusty nails, whatever, not over-oaked. And if the Viognier wasn't found in the Shiraz, we think some of it's come across to the Pinotage. Carefully used with some benefit, but again Viognier is a pushy bloody grape and if you put more than just a dab in and it'll overpower the grape that's really the dominant one, specially if Pinotage is on the label. Cabernet I felt had less character than the Pinotage"
"Pinotage blends was a very small class, but there is a wine there that is fantastic." "the palpable strength of the Pinotage class. When I walk in as Show Chairman and there's this kind of line-up of stuff that they want to show me for gold, I'm thinking we can't have ten Pinotage golds, we've got to knock a few of them out. The truth of the matter is that is was a really lovely class. There is a statement in the number of golds coming out of it, but one thing is absolutely clear, the days of judging Pinotage being a little bit of a penance are over. It had excitement, it has fruit sweetness, it had fewer faults than ever and it's certainly something worth discussing at greater length." Chris Stenberg's favourite fish recipe is halibut with a red pepper puree and bread crumb crust. But what to drink with it? I didn’t feel like going the obvious road of Pinot Gris or Chardonnay with halibut. It’s tougher and more rewarding to find a red that goes with the delicate halibut. In this case I chose the Stoneboat Pinotage Solo 2007 served slightly chilled (20 minutes in the fridge), which if I may toot my own horn for a minute, was a great choice. The Pinotage was a nice compliment to the red pepper puree. The wine was interesting enough, but not overwhelming, and I think it tied it all together quite nicely.